Solar storage has taken off over the last 2 years, to the point where we are now installing nearly all of our systems with either integrated battery storage or as a battery ready solar system. The price of solar batteries in Sydney and Melbourne depends mainly on how much capacity you want as well as any additional features such as backup for when the grid is down. Households with lower energy usage and a solar system smaller than 5kW are often well suited to Enphase batteries. An Enphase Storage System starts at a little over $5000 fully installed, or around $105 a month for 5 years. Smaller systems are designed to store power during the day to use in the evening, and typically don’t include backup functionality. For larger households with at least a 5kW solar system, the Powerwall 2 from Tesla will be a better fit. Larger solar batteries start at a little under $12,500 fully installed depending on functionality and capacity, or around $250 a month over 5-years. Remember, solar batteries capture excess solar power so you should be generating at least 8-13 kWh of excess solar power a day to charge a larger solar battery. Larger batteries are ideal for maximising self-sufficiency, reducing your household’s reliance on coal & gas, protecting your home when the grid goes down and aiming to run your home on solar power 24/7. Tesla Powerwall 2 Production Is Ramping Up! There is good news coming from Tesla’s public statements that the supply of batteries will be increased to match the demand here in Australia, in particular in Sydney and Melbourne. Although we can’t make any promises, we are expecting the waitlist for an installation to clear quickly once the batteries arrive. The sooner you place an order for installation, the sooner we can have it installed. 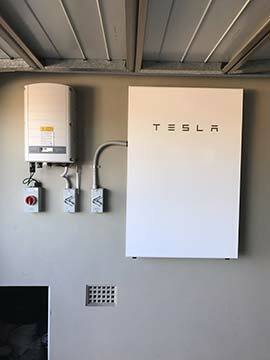 Solaray Energy is leading Australia’s solar storage revolution in partnership with Tesla. Order your Powerwall 2 home battery today with just a $200 deposit and run your home on solar power during the evening. Cycles per day 2 1 Up to 3! Solaray's Smart Battery Storage Sale Is On Now! As power prices continue to skyrocket, many Australian households are expecting seriously big power bills this year. We can help you size up a solar power system that maximises your savings using good quality brands at Australia’s best prices. We even have a way to replace your power bill completely if you are interested? How would it feel to say goodbye to your power bills this year? The price of lithium batteries continues to fall, making backup storage an affordable option for many households in Australia. The feed-in tariff for selling excess solar power back to the grid is very low in many states of Australia. In Australia, we typically get a credit on our power bill of between around 10 and 12 cents a kWh. By storing this excess solar power in batteries, we can use it during the peak billing period where prices can be over 50 cents a kWh. This is known as maximising self-consumption of solar power and is a great way to reduce your power bill. Many Solaray customers are now running their home almost entirely on solar power! Energy prices continue to rise. Even if you get a discount from your energy retailer, power prices in Australia are amounts the highest in the developed world, in some cases more than double the price for energy compared to nations such as Sweden and Finland. Nationally, prices are up more than 120% over the last 10 years, and this trend is expected to continue for the foreseeable future. By installing solar with battery storage you can lock in your power prices for the next 25 years by generating most of your own power using solar (Rolfe 2016). Australia is still mainly powered by coal. Australian households are leading the world with our uptake of residential solar power with 1.5 million systems installed, however the same cannot be said for government and big business. Most of the power generated in Australia still comes from coal, and there is reluctance in Canberra to transition to renewables. The biggest vote we have as consumers is to lead the way, installing solar power with backup storage to run our homes almost entirely on solar power. By installing a 5kW system, we take around $50,000 off the books of the coal industry and directly invest in the growing renewables industry. Solar storage systems include revolutionary energy management technology that automatically directs solar power into your home or to recharge your batteries. Online consumption monitoring allows you to monitor how much power you are using in the home as well as how much solar power your system is generating. Exciting home automation is on the way, which will allow you to send excess solar power into appliances such as to automatically turn on the pool pumps, air conditioner or underfloor heating. All of this will be able to be controlled from a mobile phone, allowing you to take back control of your power consumption. EV charging is around the corner. Installing a solar power system will allow you to charge your electric car from excess solar power, and it may even allow you to charge your home batteries from excess capacity in the car’s battery. The power grid is struggling to generate enough capacity on hot days, causing highly-publicised and disruptive blackouts in SA and around Australia. By installing solar storage, you can continue to run essential appliances such as your freezer, the internet and perhaps a few lights.